Approx size: 66cm x 66cm x 66cm (open). Baking & Preserving. Self Standing Waste Bag. Easy to clean and reusable. Ideal for garden waste (leaves, cuttings etc). Tea & Coffee. Tile Tools. Baby & Toddler. Waterproof and Rot Proof. Heavy Duty Garden Refuse Bag. For collecting weeds, Leaves, Plant cuttings, Grass Etc. 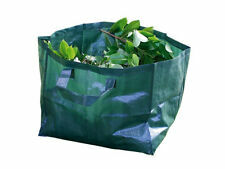 The bag is an ideal size for holding lots of garden waste without becoming to heavy to carry. Perfect for your garden waste. Heavy Duty Garden Bag. This shower proof bag is ideal for use in the garden for the disposal of leaves, grass cuttings, weeds and other general garden refuse. It comes with handles for easy transportation. Approx. Size: 17" x 16" x 19" (43cm x 40.5cm x 48cm). Please visit our store to view our full range of great products!. 90 Litre Jumbo Spring Loaded Pop-up Garden Bin. 90 Litre Pop Up Garden Bin. 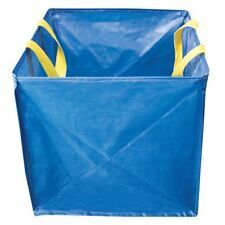 This 90 Litre capacity jumbo pop up garden waste storage bag folds flat for space saving storage when not in use. Ideal for all garden waste. They can also be used for garden waste. Capacity : 75L approx. Ideal for most general garden tasks, leaves, grass, etc. Colour : Green. Wasserabweisender Laubsack. ca. 70 x 70 x 50 cm (BxTxH). wasserundurchlässig und abwischbar. mit praktischen Tragegriffen. Inhalt: ca. 240 Liter. BERUF I HAUS I GARTEN I FREIZEIT. An den beiden Henkeln lässt er sich gut transportieren. Sie sind zur Rückgabe gebrauchter Batterien oder Akkus als Endverbraucher gesetzlich verpflichtet. - 1 Laubsack. Capacity : 75L approx. HEAVY DUTY GARDEN SACKS (8) - THICK / STRONG / DURABLE. Ideal for most general garden tasks, leaves, grass, etc. Project by:MS IT Services. Great Range of Products. Great Price & Value. We will always do our best to resolve any issues. Genuine & Authentic. Für jeden Gartenbesitzer ein absolutes Muss! Auch zum Ausmisten von Kleintierställen eignen sich die Abfallsäcke hervorragend. Ein Rundumtalent also, dieser Gartensack. Diese aus Pappe gefertigten Abfallsäcke halten aber nicht alles, was sie versprechen, und gewisse Inhalte wie Erde sind in Ihnen nicht einmal erwünscht. Auch an die Umwelt hat Noor gedacht, denn die Gartensäcke lassen sich vielfach verwenden und sind sogar abwaschbar. Es ist eine Sache, im Frühling ein großes Feuer zu errichten, aber eine ganz andere, zu jeder Jahreszeit in einem kleinen Stadtgarten sein Laub zu entsorgen. Ideal for garden waste, soil, gravel, plaster etc. Made from heavy duty woven polypropylene with double stitched seams. 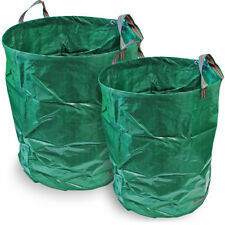 2 x Large Extra Strong Anti-Rip Garden Waste Bags. Stands up right for easy filling. Made from heavy duty woven polypropylene with double stitched seams. 3 x Large Extra Strong Anti-Rip Garden Waste Bags. Stands up right for easy filling. Made from heavy duty woven polypropylene with double stitched seams. 4 x Large Extra Strong Anti-Rip Garden Waste Bags. Stands up right for easy filling. Large Extra Strong Gardening Storage Bags. Made from heavy duty woven polypropylene with double stitched seams. Product Features Size : 120 Litres. Made from heavy duty woven polypropylene with double stitched seams. Stands up right for easy filling. Size : 120 Litres. Quantity: 2 x Heavy Duty Bags. Large Extra Strong Electrician / Handy Man / Builder Tough Waste Bags. Made from heavy duty woven polypropylene with double stitched seams. Stands up right for easy filling. Folds up for easy storage. 2 x Large Extra Strong Electrician / Handy Man / Builder Tough Waste Bags. Made from heavy duty woven polypropylene with double stitched seams. Stands up right for easy filling. Size : 120 Litres. Town & Country Garden Tidy Bag. Small . Multifunktionstonne Gartentonne Laubsack Abfallsack Garten 120 Ltr. Mit 2 Verschluss-Halterungen. Multifunktionstonne für den Garten. mit buntem Laub bedruckt. Praktisch und dekorativ zugleich. Maße: ca. 50 x 60 cm (ØxH). Fassungsvermögen: ca. 120 l.
Pop up garden bin/ Garden pop up garbage bin. Steel springs keep bag upright and open. 3 Rolls of 24 Kitchen Caddy Bin Liners. All we ask is that the goods are unused, unopened and in their original condition. Fits 5,7 & 10 Litre Caddies. Go Green Buy British. Made Using Corn Starch. 3 x Large Extra Strong Electrician / Handy Man / Builder Tough Waste Bags. Made from heavy duty woven polypropylene with double stitched seams. Stands up right for easy filling. Size : 120 Litres. Made from heavy duty woven polypropylene with double stitched seams. Large Extra Strong Anti-Rip Garden Waste Bags. Stands up right for easy filling. Made from heavy duty woven polypropylene with double stitched seams. Stands up right for easy filling. Size : 120 Litres. Quantity: 4 x Heavy Duty Bags. 4 x Large Extra Strong Electrician / Handy Man / Builder Tough Waste Bags. Made from heavy duty woven polypropylene with double stitched seams. Stands up right for easy filling. Size : 120 Litres. Made from heavy duty woven polypropylene with double stitched seams. Quantity: 2 x Heavy Duty Bags. Product Features Stands up right for easy filling. Der Profisack für Gartenabfälle, Einkäufe und Transport. Made from heavy duty woven polypropylene with double stitched seams. Quantity: 3 x Heavy Duty Bags. Product Features Stands up right for easy filling. Mit zwei seitlichen Tragegriffen. 240 Liter Tasche für die Gartenarbeit. 240 LITER GARTENTASCHE DUNKELGRÜN. COMPUTER ZONE. Made from heavy duty woven polypropylene with double stitched seams. Stands up right for easy filling. Size : 120 Litres. Quantity: 3 x Heavy Duty Bags. 50 x 40 x 50 cm.